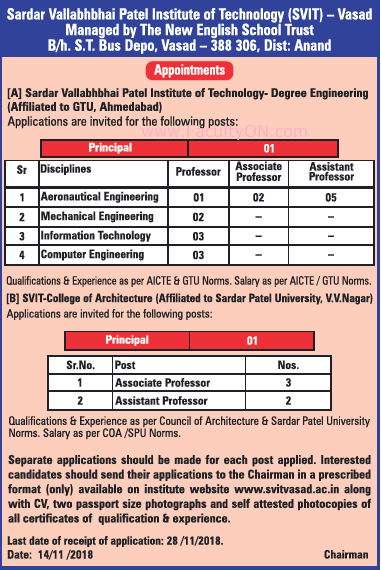 Sardar Vallabhbhai Patel Institute of Technology, Vasad has advertised in THE TIMES OF INDIA newspaper for recruitment of Professor / Associate Professor / Assistant Professor / Principal jobs vacancies. Interested and eligible job aspirants are requested to apply on or before 28th November 2018. Check out further more details below. About College: Sardar Vallabhbhai Patel Institute of Technology was established in 1997 with the ideals of Shri Sardar Vallabhbhai Patel. The New English School Trust, Vasad, constituted the Board of Management of SVIT under the chairmanship of an educationist and administrator of Gujarat, Prof. Shantibhai M Amin, Shri.Shivakaka and Shri. Chandukaka. SVIT houses an Aeronautical Engineering division as well, the only one in the State of Gujarat, with an intake of 60 students. It also has Architecture as a branch, called the College of Architecture. How to Apply: Interested and eligible candidates are requested to send application in prescribed format downloaded from college website along with CV, originals & copies of certificates and 02 recent passport size photos to the postal address provided below.